Sure, you can cook steak at home, but you can't beat this one. In the age of the Thermapen and the sous vide machine, getting home-cooked steak precisely as cooked as you want it is not exactly rare. But for great steak? Swap your "Kiss the Chef" apron for a suit jacket and tie and trade your socks and sandals for your wedding shoes. Take me to Churchill's. You see, neither your little Browne's Addition stove nor your discounted Home Depot barbecue grill gets up to the screaming hot 2,200 degrees Fahrenheit of the grill at Churchill's. Your steak, no matter how desperately you want it to, will never have the incredible Pittsburgh-sear char you get at Churchill's. You won't have that crunch of fat-charred flavor surrounding every succulent bit of red meat. 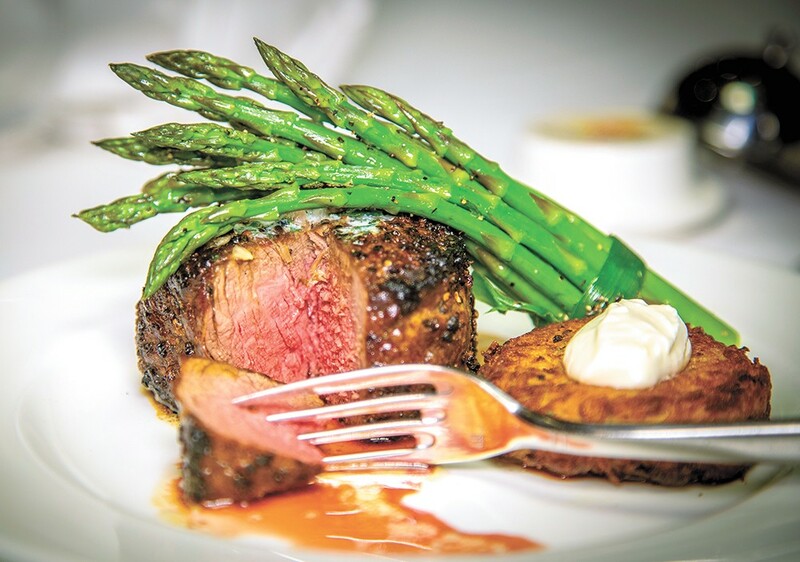 It's one reason why former Downtown Spokane Partnership president Mike Tedesco — an amateur steak cook himself — dedicated a gushing review on his Spokane Planner blog last week to why the steak he gets at Churchill's is so much better than the more delicate fare at other restaurants. "No I don't want the mashed cauliflower with a sprig of rosemary paired with tortilla soup and some foreign cucumber infused cocktail; I want a perfectly aged, perfectly cut, perfectly cooked steak with perfectly charred crust paired with a perfect peppercorn sauce," Tedesco writes. "If you're looking for salvation, Churchill's is like John the Baptist for Spokane's food scene. Hell, they even have church in the name." At first, the prices at Churchill's can seem a little steep. But, then, when you have that first bite of medium-rare filet mignon, and you close your eyes to savor it, you'll say: "Ah. That's why." The original print version of this article was headlined "Best Fine Dining, Best Steaks: CHURCHILL'S STEAKHOUSE"